Colorful prayer flags are one of the most common sights when travelling around Bhutan – you will find them at temples, chortens, mountain tops and even at the back of some vehicles. Vertical ones, called Darchor. Dar translates as “to increase life, fortune, health and wealth”, and Cho translates as “all sentient beings”. 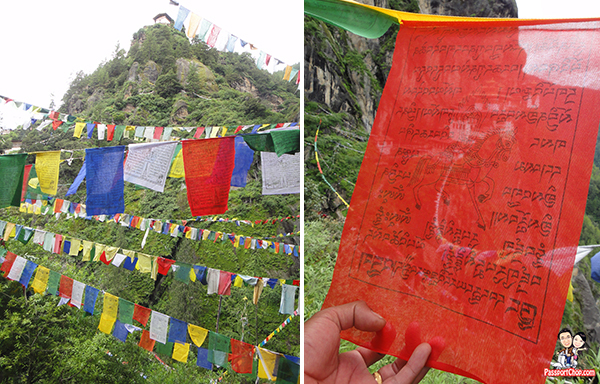 Lung Ta (horizontal) prayer flags are of square or rectangular shape and are connected along their top edges to a long string or thread. They are commonly hung on a diagonal line from high to low between two objects (e.g., a rock and the top of a pole) in high places such as the tops of temples, monasteries, stupas or mountain passes. They are also known as Wind Horse flags because the “Wind” will spread the prayers and mantras on these flags around the world at the speed of a “Horse”. Traditionally, Lung Ta come in sets of five, one in each of five primary colors. The five colors represent the elements and are arranged from left to right in a specific order: blue (symbolizing sky/space), white (symbolizing inner-self/cloud), red (symbolizing fire), green (symbolizing water), and yellow (symbolizing earth). Darchor (vertical) prayer flags are usually large single rectangles attached to poles along their vertical edge. They are commonly planted in the ground or on rooftops. Although they can also have the 5 different colours mentioned above, they are very often all white in Bhutan. Prayer flags are used to promote peace, compassion, strength, and wisdom. The flags do not carry prayers to gods, a common misconception; rather, it is believed that the prayers and mantras will be blown by the wind to spread the good will and compassion into all pervading space. Therefore, prayer flags are thought to bring benefit to all. What a beautiful wish consist a single and short words “Darchor and lung ta”. Wow! This is my first time to know about the beliefs of Bhutan people. I wish I could visit the place too and can do the prayer flags. This is a very informative post to read. Bhutan is one of the destinations I would visit eventually. I also told the best time to visit is March/April. However, it is not cheap to visit Bhutan where a person typically has to pay about USD3k for a trip.